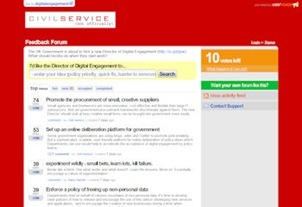 Steph’s first contribution looks at what needs to be done, eliciting 21 propositions completing the sentence “I would like the Director of Digital Engagement to…”. Anybody is free to add to the list and to vote on their own and others’ ideas. The voting is showing an interesting pattern, with three clear groups: one idea which has led the voting from the outset, a second group of six ideas with consistent strong support, and a long tail of fourteen ideas with gently declining scores (the lowest score is one vote, meaning that not even the person suggesting it thought it was that good). The leading idea is Promote the procurement of small, creative suppliers, addressing the very specific – and very real – problem of how to do quick implementations in a world of cumbersome contracts with large IT providers which were never designed for small guerrilla projects on the cutting edge. The first idea attempts to solve the problem by changing the rules on procurement; interestingly, the second-ranked idea – Set up an online deliberation platform for government – is aimed at a variant of the same problem through the provision of a platform which means it only needs to be solved once rather than many times. The second tier of ideas aren’t quite as easily lumped together, and it would be completely unfair to generalise, but I am going to anyway. Several of them are broadly (very broadly) about how to get the tools into use and get useful things done with them – promoting experimentation, making sure that civil servants are blocked from social media, and more generally and more succinctly, implementing the POIT recommendations. A team capable of filling all those roles and the different mixes of skills behind them would be a very powerful one. It’s notable – and no doubt part of the point being made – that only one of them is a techy role in any normal sense, reinforcing the idea that it’s the engagement which is at the centre of digital engagement. But there is, I think, something critical missing, at least for organisations where many senior decision makers are somewhere between unfamiliar and uncomfortable with all of thus – which I suspect covers most of the UK public sector. Barack Obama’s web team is certainly one of the best that has ever been assembled. His staff did a fantastic job on the campaign site, and produced an also excellent, if slightly less dynamic, transition site at Change.gov. On its way to the White House, however, a team comprised of many of the same people seemed to lose its mojo. The complaints about the new Whitehouse.gov site—slow to be updated, lacking in interactivity—are familiar to observers of other .gov sites throughout the government. What happened? It’s not plausible to suppose that Obama’s staffers have somehow gotten worse as they have moved from campaign to transition to governance. Instead, they have faced an increasingly stringent and burdensome array of regulations as they have become progressively more official. The transition was a sort of intermediate phase in this respect, and the new team now faces the Presidential Records Act, the Paperwork Reduction Act, and a number of other pre-Internet statutory obligations. This experience teaches that the limitations of the federal web reflect the thicket of rules to which such sites are subject—not the hardworking people who labor under those rules. For very good reasons, a lot of the change we have seen so far is at the edges – it’s easier, safer, more productive and considerably cheaper to be subversive there than at the core of delivery. That can lead to more widespread and deeper change – indeed, in the long run it will lead to more widespread and deeper change – but it’s a hard and slow way of doing it. In the early stages, it’s probably also the only way of doing it. What we are now seeing is the beginning of the transition to the next stage of change, a micro-instance of the innovator’s dilemma together with the frustration of slow change. This is still a tiny minority. The total number of votes on the 21 propositions implies that about 40 people have voted. That suggests the existence of a big enough group to make a difference, but one which remains a tiny fraction of the population it is seeking to influence. To take just one subset of that, there are 4,750 senior civil servants, who form a group which it is critically important to influence but is largely innocent of any understanding. Most of them won’t be on the leading edge of any of this, but many more have the power either to facilitate or to obstruct and it is critically important which of those they choose to do. That choice will be based not on whether all this is a good thing or not, but on whether it helps them achieve their objectives – so what they need to know is whether and how it will. So there is definitely a job to be done. And this is a job for a generalist – not any random generalist, to be sure. For both the skills and the positional authority needed to make this work at the next level, she will need the status – and therefore the money – which in the Whitehall pecking order is the quick indicator of who comes where. Whether such a paragon exists, whether even such a paragon could meet the expectations set in the job description, and whether the job description is written in a way which maximises the chances of the right people applying all for now remain uncertain. This is a good round up. I haven’t blogged much about this but I have the feeling too much is being invested in one person. Plus there are a lot of other things, basic things, getting left behind whilst the focus is on ‘engagement’. It’s very easy to forget the ‘customers’ and I think there’s lots of other stuff they want from government besides being asked to engage. This is why if I was suggesting anything as a ‘priority’ it would be ‘plotting to get John Suffolk sacked’!